AR SAVES, led by the University of Arkansas for Medical Sciences (UAMS) Center for Distance Health, presents an innovative solution to a complex, statewide problem. AR SAVES is a state-wide stroke management system, which helps to ensure timely treatment of stroke patients by linking emergency room doctors at participating hospitals to specially-trained vascular neurologists via live, two-way video, 24-hours a day. Many of Arkansas' rural hospitals lack staff resources to accurately identify and manage patients who may benefit from receiving a clot-busting drug. The window of time needed to effectively administer the clot-busting drug is often lost when stroke patients are transported to a better-equipped facility. This means that Arkansas' stroke patients could be missing out on a quality-of-life-saving drug that significantly improves the chances of recovery while reducing permanent, stroke-related disability and, quite possibly, mortality. AR SAVES specifically targets these shortcomings by increasing access to subspecialty expertise through telemedicine technology, ground-breaking medications and the expertise of vascular neurologists. Hospitals selected to participate in AR SAVES are equipped with telemedicine technology, training for personnel, support for a dedicated telestroke coordinator and ongoing education. These are the most common symptoms of stroke. However, each individual may experience symptoms differently. If any of these symptoms are present, call 911 (or your local ambulance service) immediately. Treatment is most effective when started immediately. One or more of the symptoms listed above may occur. Do not ignore any of these symptoms, even if they go away - take action immediately. 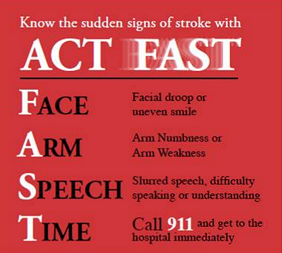 The symptoms of stroke may mimic other medical conditions or problems. Always consult your healthcare provider for a diagnosis. What is a TIA, or Transient Ischemic Attack? A TIA, commonly called a mini-stroke, is a stroke warning, where the same symptoms can occur suddenly, but only last for a few minutes to up to an hour. The risk of stroke is greatly increased in the thirty days following a TIA; therefore you should call for medical help immediately if you suspect a TIA. Not all strokes, however, are preceded by TIA. For more information on our AR Saves program, contact the program facilitator, Kathy Hall, at (870) 226-4305.